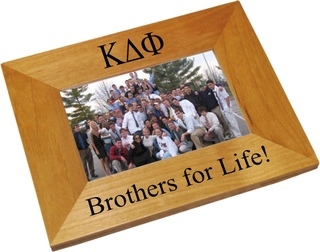 If your plan is to really wow the Kappa Delta Phi in your life, shop for and buy his gift from Greek Gear's selection of wooden Paddles and Picture Frames. This is one of the most popular gift ideas for fraternity members. If you've been planning what your very own custom paddle will look like, you can make it a reality with our DYO browser tool. It's a tool that allows you to add images, clip art and letters in various fonts to your item of choice, in this case a Greek paddle. Click the link and browse down through the various paddle shapes available -- there's a Rose-Flower Symbol Greek Paddle if you want to pay homage to your yellow rose fraternity flower. There's also a DYO Giant Greek Paddle with a standard handle that's 30 inches tall. What's the last photo that you and your chapter brothers took together? Instead of leaving it on your phone, print it out and put it inside of a Wood Picture Frame. You can personalize the bottom with the message "Brothers for Life" as pictured, or any saying that you guys say often. Our specialty is in providing you with gifts that can be customized and personalized, like these Kappa Delta Phi Paddles and Picture Frames. Who doesn't love a present that features their name and details? Order yours today! 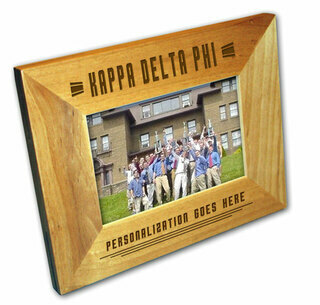 Kappa Delta Phi Paddles & Picture FramesThe Greatest Selection. Period.